Living Area 6,000 Sq. ft. 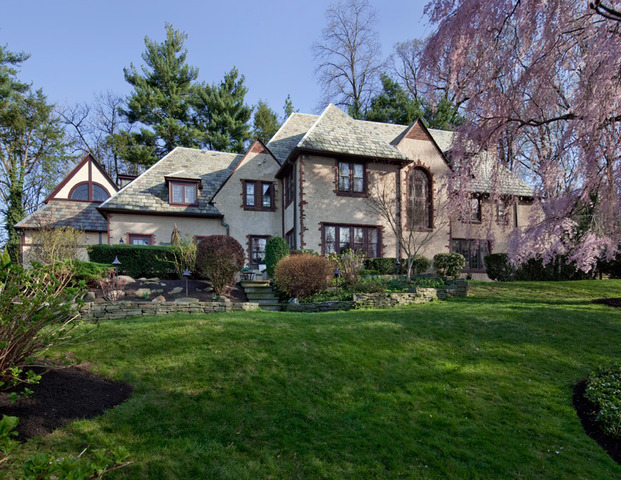 This majestic Elizabethan/Tudor Revival was designed by Brenton G. Wallace and Frederic G. Warner, prominent architects in the Philadelphia and Main Line area during the 1920’s. 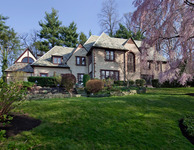 Wallace and Warner drew from the history of romantic architectural styles for their inspiration of this Storybook house. The home has every refinement and detail of an era gone by as well as all the modern amenities that are desired in a modern home. Sited on a gorgeous park-like setting with beautiful specimen plantings and stone wall terraced gardens, this home combines the serenity of country living while having all the suburban conveniences of being in the Estate Section of Wynnewood. EXTERIOR: The Elizabethan/Tudor Revival was popular in the United States when this home was built and this stunning home beautifully exemplifies its form: Complicated high-pitched peaked rooflines, Asymmetry and rambling form, Rounded arched doorways and Multiple lights in the windows. The front second story features other charming details with the decorative Quatrefoil motif on the half timbering, the Overhanging front bay with bargeboard, and the use of decorative brick work trim that serves as an accent around all windows and doors. INTERIOR: Featured is a beautiful new addition which includes: a gorgeous state-of -the-art media room with custom wood beamed cathedral ceiling, a granite counter-top wet bar, built-in saltwater aquarium, a first floor powder room, and a 2 1/2 car garage. Third floor has been finished with full bath and a large tastefully appointed room, perfect for a Nanny Suite, Recreational Space, or an additional Bedroom. Also, there is a newer renovated eat-in Gourmet Kitchen with granite counter tops, stainless steel appliances, and attached full-service Butler’s Pantry. The interior follows a more traditional Tudor form with its elegantly proportioned light-filled rooms, stunning grand entrance hall and staircase, arched doorways, and Palladian windows. There is exquisite mill work throughout the house that includes: a carved wood coffered ceiling in the den, wide generous moldings, and an extraordinary living room mantle with painted pastoral panels, and beautiful wood floors.